With years of front line experience in permanent airport facility equipment Operation and Maintenance (O&M) services at a range of large international and regional airports, ELS has established itself as the “go to” company for airports and airlines that demand high quality services and best value programs. Our customized and quality approach to each airports requirement has built a trusted industry reputation for planned and corrective maintenance for sophisticated In-Line Baggage Handling Systems (BHS), Passenger Boarding Bridges (PBB), Facilities, Ground Support Equipment (GSE) and airport Vehicle Fleets. 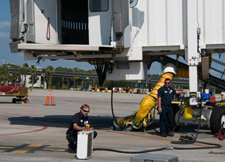 Our full service, responsive and flexible programs are fully integrated with our customers operations to allow our technicians to efficiently and safely perform as an extension of the airports operations. Our aim is simple; to allow our customer to distance themselves from the day-to-day maintenance responsibility of their specialized systems by delivering upon the assurance that their equipment is in safe and capable hands, to better enable each to focus their time and resources in meeting their most important business and growth objectives for their airport. Click here to view the Elite Line Services company video and learn more about their baggage handling system, passenger boarding bridge, and ground support equipment services.